On to the next page full of mods. 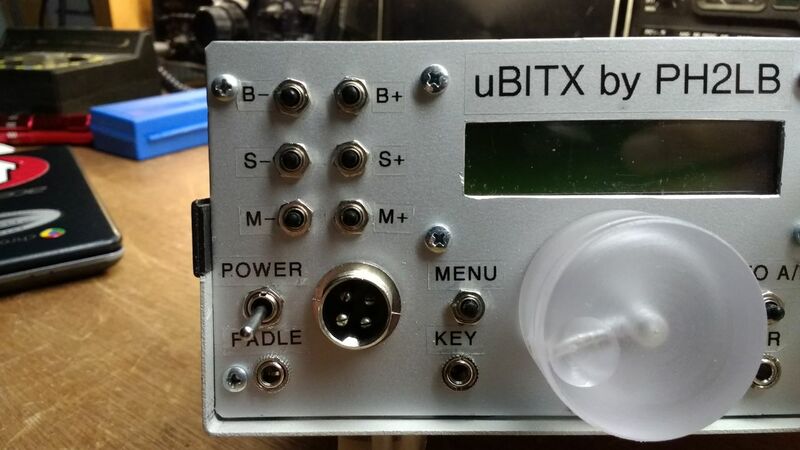 I was thinking about a adding lineout to my uBitx so I could monitor WSPR and FT8 signals. 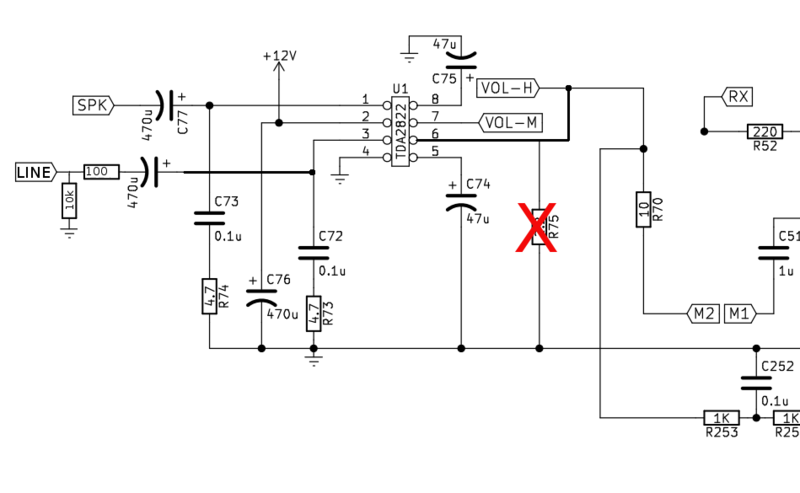 Looking at the schematic around the TDA2822 (I have a V3 board : link) the easist way could be just to tap the yellow wire (VOL-H) and feed it outside. But then the connection would put a extra load to the original signal so a buffer would be a must. On bitx20@groups.io page Walter W9KJO started a topic with the same idea. 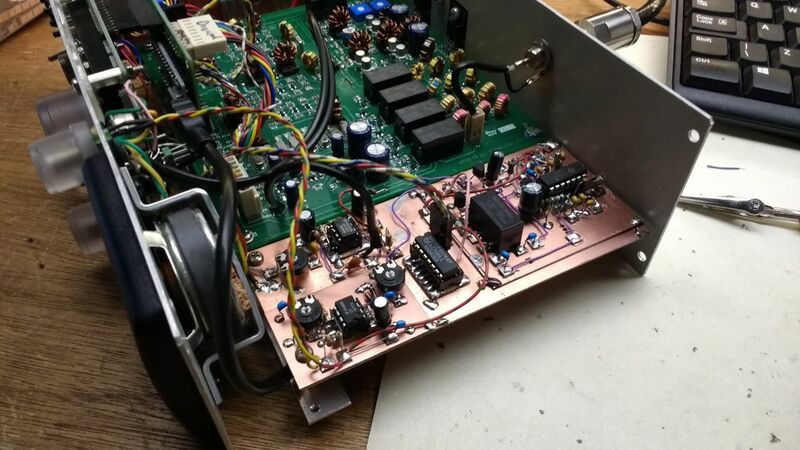 In one of the replies Clark Martin, KK6ISP explaned how you could used the un-used part of the TDA2822 amplifier as a buffer. That would be the basis for the mod I implemented in my uBitx. 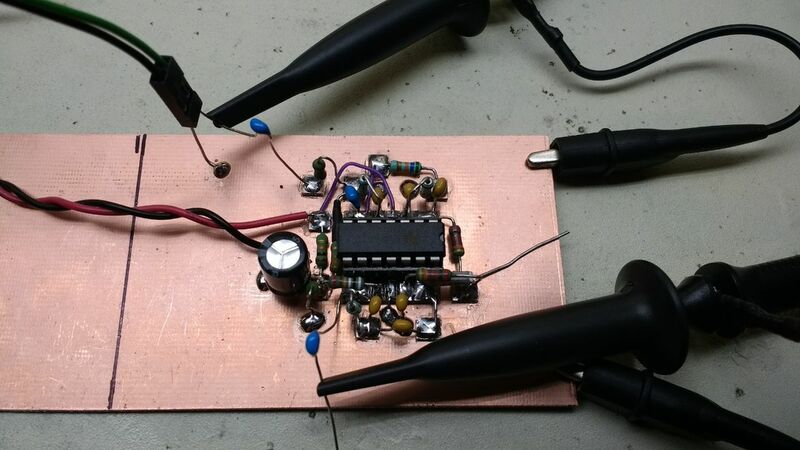 Use a small piece of PCB and solder the one side of the 10K variable resistor to it. 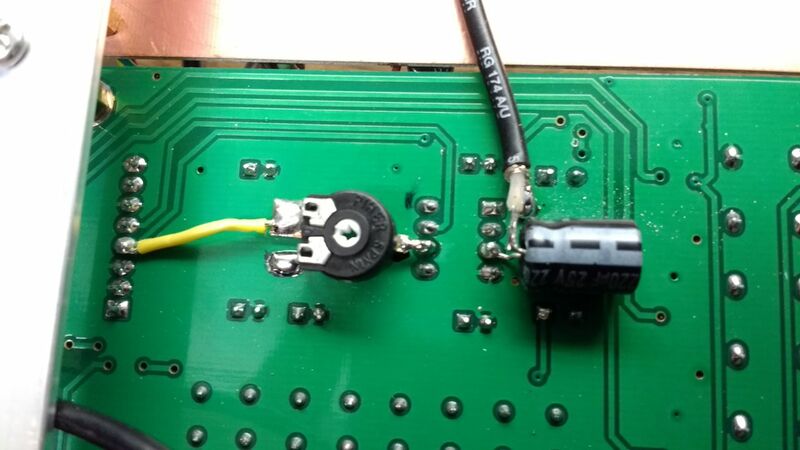 Install the 10K variable resistor (see picture below) and connect the runner to U1 pin 6. 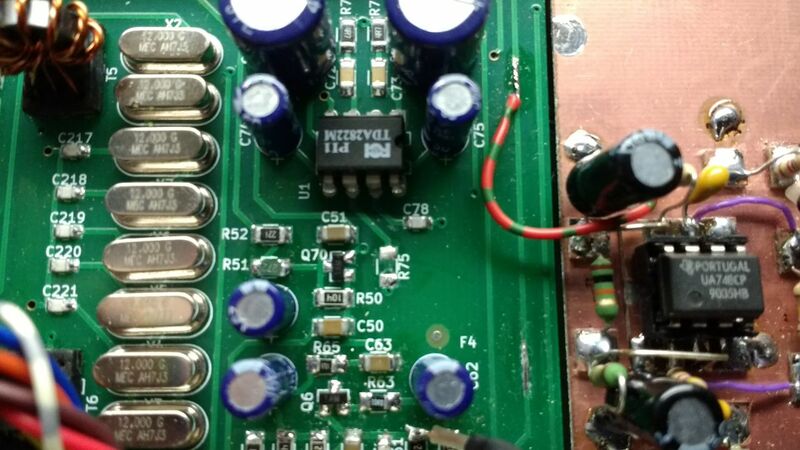 Connect the + terminal of a 470 µF, 16V electrolytic capacitor to U1 pin 3. Tip : add some hotglue to the capacitor that will keep it in place. 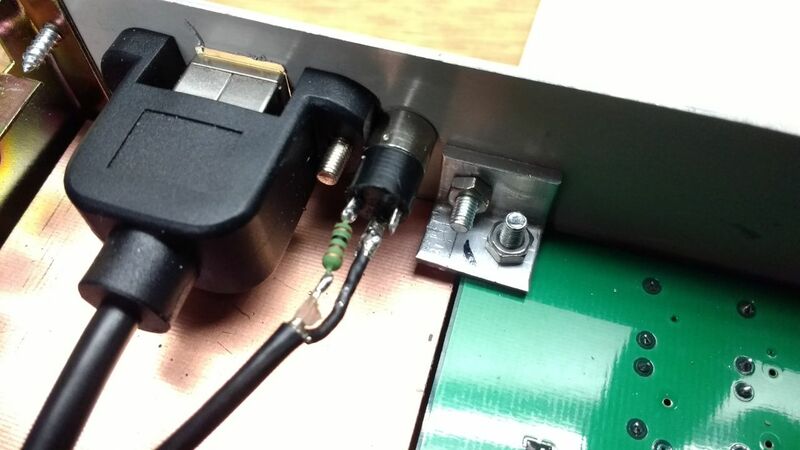 Connect the center of the coax to one side of a 100 ohm resistor. Connect one side of a 100 ohm resistor to the auxiliary out mini jack. 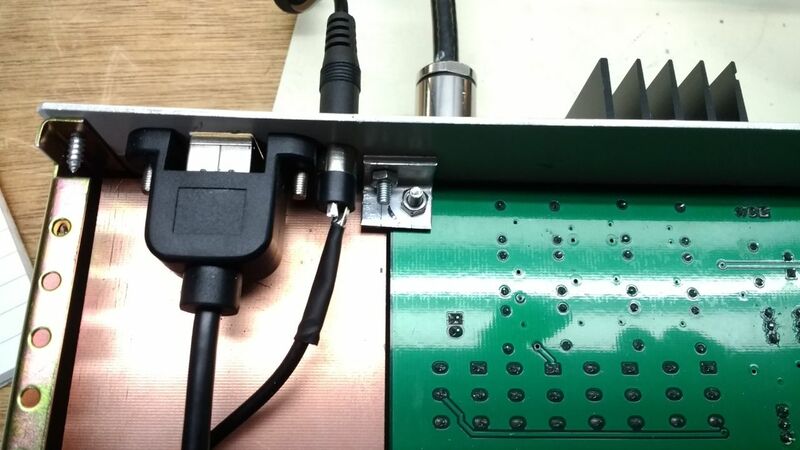 Connect the shielding of the coax to the ground of the auxiliary out mini jack. Connect one side of a 10k ohm resistor to the auxiliary out mini jack. 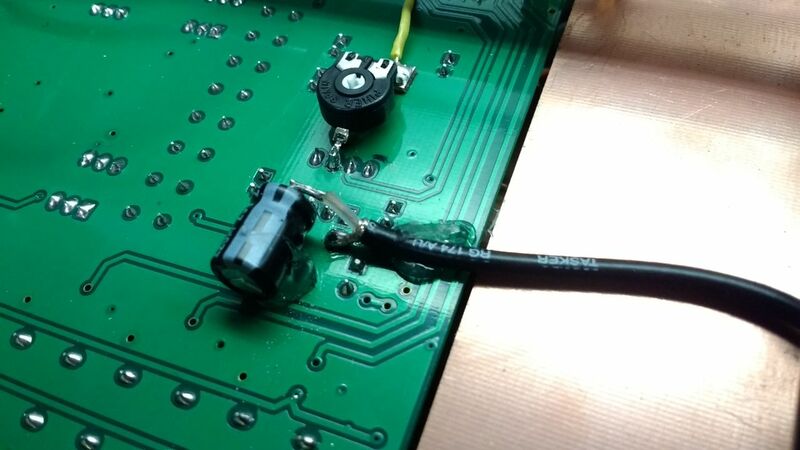 Connect the other side of the 10k resistor to the ground of the auxiliary out mini jack. 14th mod : CW audio filter. 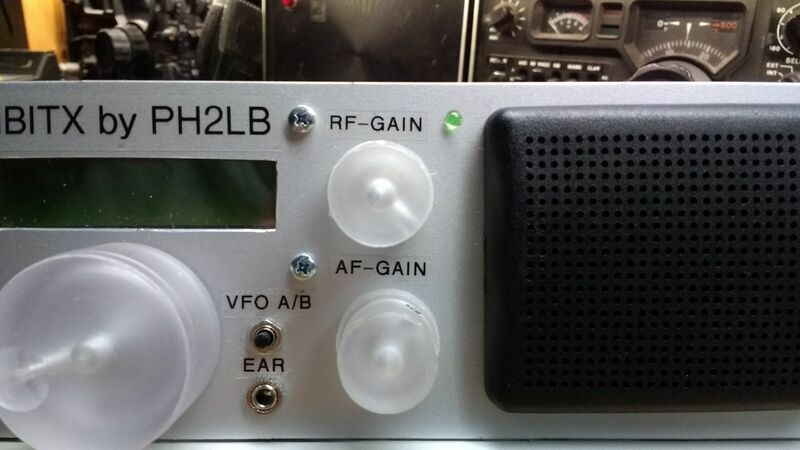 When you want to listen to CW with the uBitx you will find that the filters are quite brought which will pickup a lot more CW signals then you want. Because the uBitx V3 doesn't have to option to install a secondary filter you could switch by relay, one option is to install a CW audio filter. 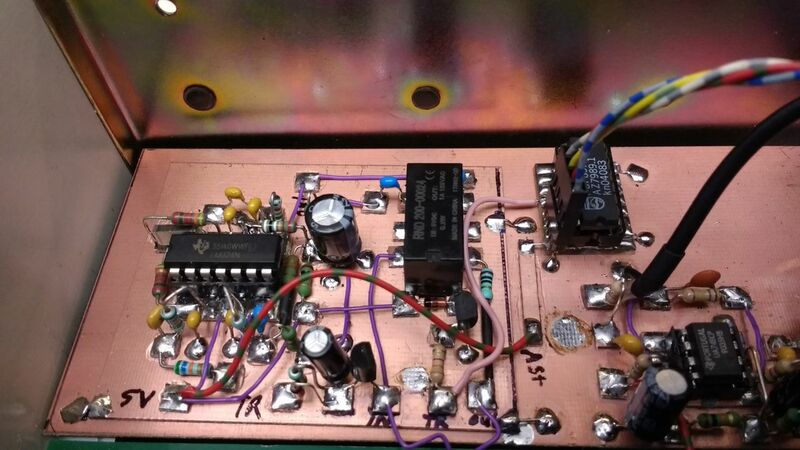 This CW Audio filter can be installed inline with R70 (the 10 Ohm resistor on a V3 board) see the schematic above used in the 13th mod. 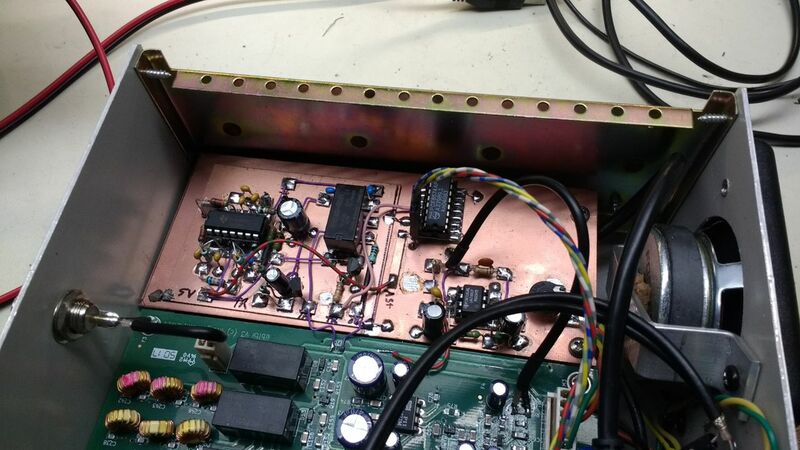 There a variouse designs on the internet but my eye fell on the HI-PER-MITE, an 200hz width active audio CW filter which is designed by David Cripe, NM0S (check out the interview with him on QSO Today). 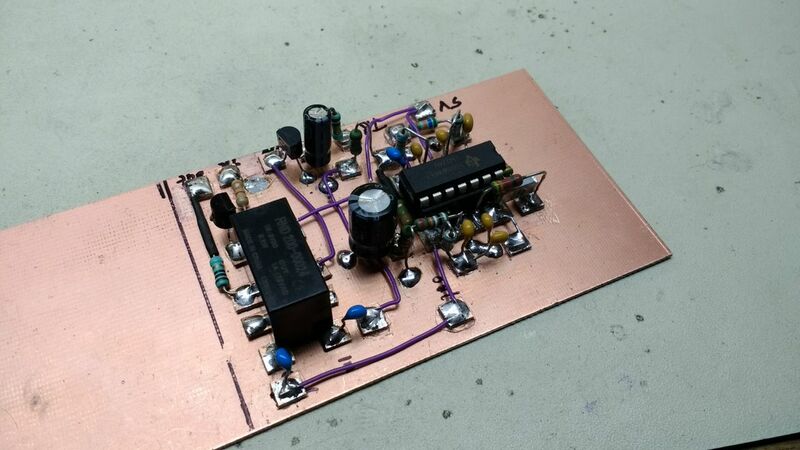 The schematic and working is published on the HI-PER-MITE page of the Four State QRP Group. After studing the schematic I shifting through my spare parts stock to collected the components and build one according there design on a breadboard (I changed the center frequency from 700 to 600Hz). I hooked up my signal generator with a amplitude of 2v max and sweeped it from 250Hz to 2KHz looking at the output on my rigol osciloscoop. 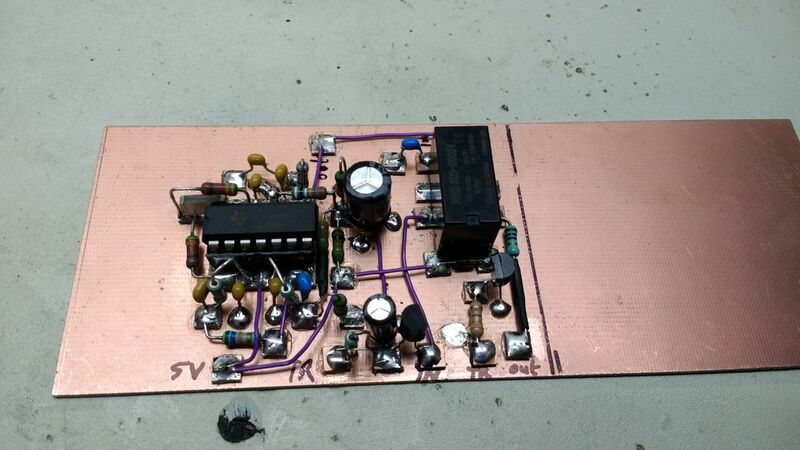 On 2khz VMAX=0.04V, 885Hz=0.2V, 700Hz=1.5V, 662-585Hz=2V, 400Hz=0.2V, 500Hz=0.9V, 250Hz=0.04V. So a nice flat top between 585Hz to 662Hz. Next step is putting on a PCB so I could insert it into my uBitx. Using the manhattan style I placed the components on a PCB and tested it again (slight shift in center frequency but just aprx 25 Hz so acceptable). Next I added a relay to allow switching the filter inline and while I was at it, I also added the v4 pop fix for v3 boards to the PCB. I added a inline 10 Ohm resistor so I could drop in replace it on the uBitx PCB. I installed the new filter and added a tempory switch to turn the filter on and off. But the the temporay switch isn't the correct way to switch the filter on and off (could do but I don't have enough room on the frontpanel any more). There fore I have modified my custom firmware by adding the modes CW and CWR (will be posted on my github page shortly) which switching the filter on in the CW and CWR mode and off when in USB or LSB. But there was one problem, all IO pins on the Raduino control board where used. So to get more IO I added a aditional PCF8574AP (the first was added in the 5th mod : again adding extra buttons) which at startup will be configured as outputs. A new function in the firmware allowes the pins to be turned on and off throughout the firmware when needed. Using only one output at the moment it leafs me with 7 spare outputs (or inputs) for future mods. In the pictures below the final installation. Note : yes the the v4 pop fix for v3 boards is on the PCB but not connected yet. 15th mod : CW zerobeat led. In variouse CW decoders a LM567 tone detector is used to detect a specific frequency in a audio signal which is fed into a microcontroler to do the morsecode decoding. 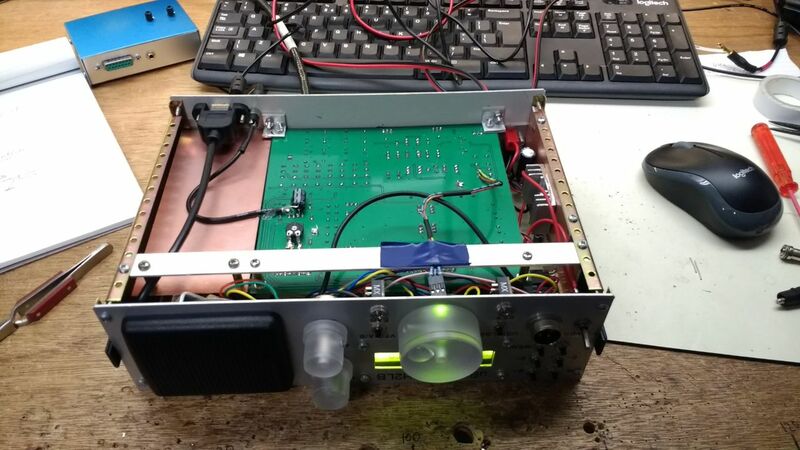 In the April 2015 issue of the Electron, the club magazine of the VERON (one of the Dutch hamradio clubs) there was schematic on how to use the LM567 in combination with a Arduino to make a stand alone morsecode decoder. The VERON department A08 has build a prototype and updated the hardware design to be more stable. 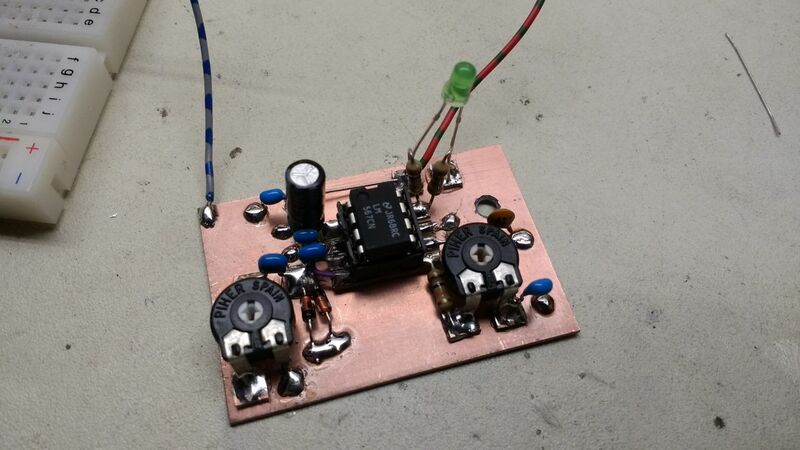 There version of the LM567 decoder would be the base for my CW zerobeat led. Because I want to zero beat a signal and don't need the full range of 300hz to 2.3Khz I recalculated the components for the frequency setup. And now they have a selection range of aprx 500Hz to 700Hz which fits my CW filter perfectly. 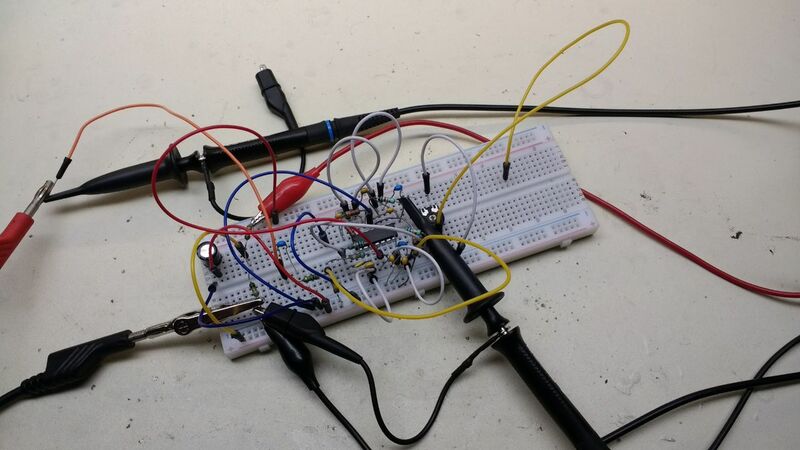 I shifted through my spare parts stock to collected the components and build one according there design on a breadboard and hooked up my audio generator to test ist. 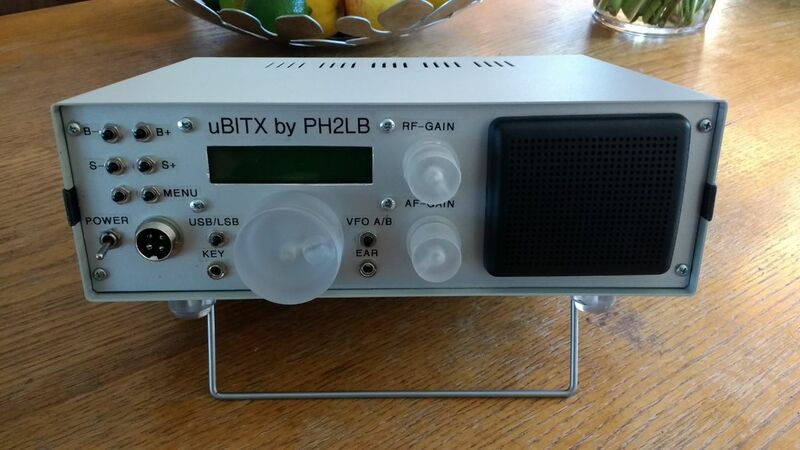 And after the final test, it was time to install in the uBitx. 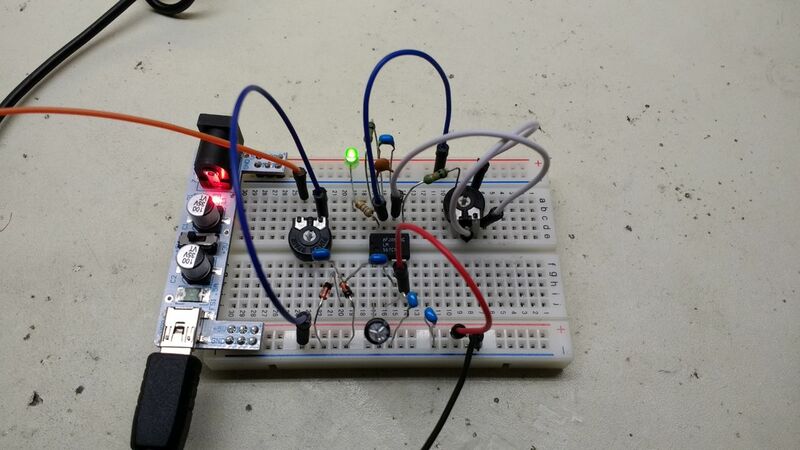 The small 3mm LED is located near the speaker and is blinking like a christmas tree when a morse signal is zerobeat. Maybe not perfect, but I'm happy with the result. 16th mod : minor menu update. As described in the 14th mod I wasn't happy with the way the modes are switched at that moment. So I modfied the firmware that instead of cycling through them USB > LSB > CW > CWR with one button (the one left of the dial) it's now posible to select mode like selecting bands and steps. The bottom 2 buttons are now M- and M+ and the button left of the dial is now the menu button. The new firmware is now uploaded to my github repository. Although I don't have any room left on my mod PCB there are more mods to be added in the future.